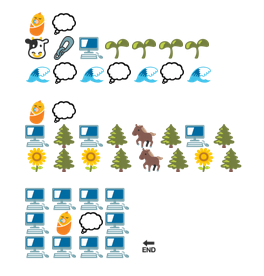 In the DWRL’s most recent workshop, staff members looked at two of the most apparent–but perhaps most easily dismissed–exemplifications of visual rhetoric: emojis and GIFs (Graphics Interchange Format). Although we’ve all likely interacted with both emojis and GIFs before–whether you see them as a mildly amusing (or annoying) novelty or an essential part of how you communicate with others–we wanted to do more than glance at these visual vehicles of expression, and instead explore their affordances and limitations. Splitting the workshop into halves, during the first hour, staffers worked on translating the Richard Brautigan poem “All Watched Over by Machines of Loving Grace” into emojis. Afterwards, we discussed our different approaches, with the staff, for the most part, attempting to write based on syllables, by adhering to (and perhaps forcing) a one-to-one word-to-symbol ratio, or conveying the general sense of particular lines in the poem. An emoji-version of “All Watched Over by Machines of Loving Grace” by Richard Brautigan. Rather than trying to identify what method was “correct,” we instead considered how emojis are different than words, but not necessarily lesser than them, as the emoji poems were evocative in their own right. As such, incorporating emojis into the classroom might be a productive way for students to recognize and build upon the rhetorical savvy they already possess.